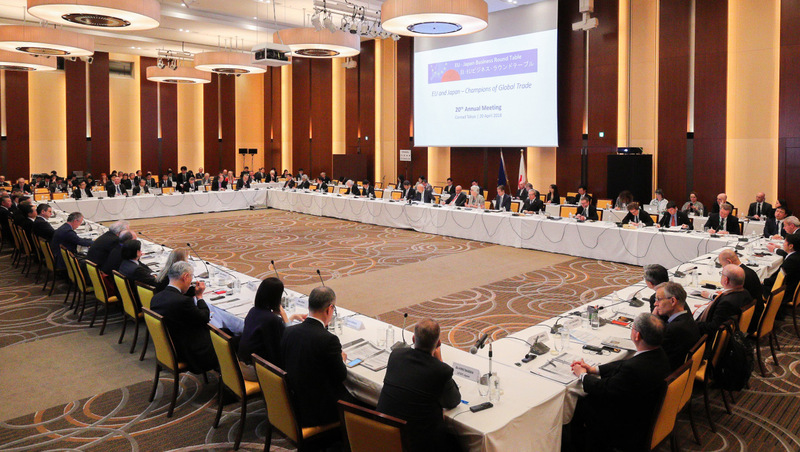 Since 1999, senior executives from businesses in Japan and the EU have met annually to discuss ways of encouraging greater trade and investment. The forum, called the EU–Japan Business Round Table (BRT), boasts leaders from nearly 50 well-established multinationals, including Airbus, Bayer, IKEA and Rolls-Royce on the EU side, and Mitsubishi Heavy Industries, Nissan, Sony and Toshiba on the Japanese side. The EBC has participated in the BRT from the outset. On 20 April 2018, members of the BRT along with representatives from the EU Commission and the Japanese government came together at the Conrad Tokyo for the 20th BRT meeting. The day of discussions was divided into four themes: the Japan–EU Economic Partnership Agreement (EPA); the digital and data economy, cybersecurity and blockchain; the Sustainable Development Goals; and regulatory cooperation and interoperability. As this was the first BRT meeting held since the finalisation of the Japan–EU EPA in December, participants’ talks throughout the day — including those by the high-level government officials present — addressed this major achievement and what lies ahead. “I believe that the successful finalisation of this agreement is indeed an outcome of close cooperation within the business sectors represented by this BRT and other players,” said Kazuyuki Nakane, Japan’s state minister for foreign affairs. The EPA will create an unprecedented trading block, covering a combined population of more than 600 million and 30% of global GDP. Trade and investments are expected to grow substantially on both sides. From the EU Commission, Lowri Evans, director-general for Internal Market, Industry, Entrepreneurship and SMEs emphasised the need to ensure the EPA is implemented effectively. “It won’t be implemented unless businesses take advantage of the new opportunities, unless businesses understand that this agreement means it’s not business as usual, it’s better than business as usual,” she said. Evans noted that raising awareness about the opportunities of the EPA, especially among small and medium-sized enterprises (SMEs), was a top priority for the EU — and critical for the agreement’s success in an increasingly protectionist world. During the discussion on the EPA, a talk given by Duco Delgorge, president and CEO of organic food supplier Mie Project and an EBC member, underscored this need for SMEs to be able to use and reap the benefits of the agreement. According to Delgorge’s figures, there are some 3.8 million SMEs in Japan that account for 99.7% of the nation’s total number of companies. In the EU, there are approximately 21 million SMEs, representing 99% of the total there. Another discussion dealt with the digital and data economy, cybersecurity and blockchain. “Digital will change not only the digital sector, but also society and the way that we do trade,” said Cecilia Bonefeld-Dahl, director general of DigitalEurope, an organisation representing the digital technology industry in Europe. Norihiko Ishiguro, senior executive vice president at IT firm NEC, also expressed the view that without the smooth flow of data across borders, it will be hard to achieve the level of growth in trade anticipated between Japan and the EU. In the months prior to the BRT, four working parties held discussions to compile a list of joint recommendations in areas including life sciences and biotechnology; and energy, the environment and sustainable development. One of the working parties, co-chaired by EBC Chairman Danny Risberg, dealt with trade relations; investment and regulatory cooperation; as well as financial services, accounting and taxation. Another of the working group’s recommendations to the Japanese government was to “lower the threshold for public tenders to significantly improve access to the public procurement market in Japan,” Risberg said. All four working parties’ recommendations were formally submitted to the EU Commission and the Japanese government after the BRT ended. 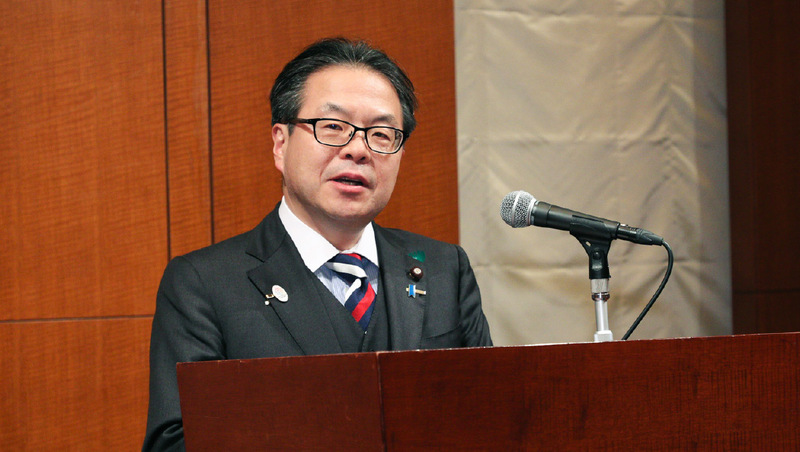 To conclude the BRT, Hiroshige Seko, Japan’s minister of economy, trade and industry, briefly addressed the attendees.